In progress: a post about researching and georeferencing fabulous historical basemaps. (Really… who can resist a 1942 map entitled “The Good Neighbor Pictorial Map of South America”?) But for now: a bit of experimentation with composite maps. Before moving on to keying off of other datasets, there is more to do with putting together my own data differently. 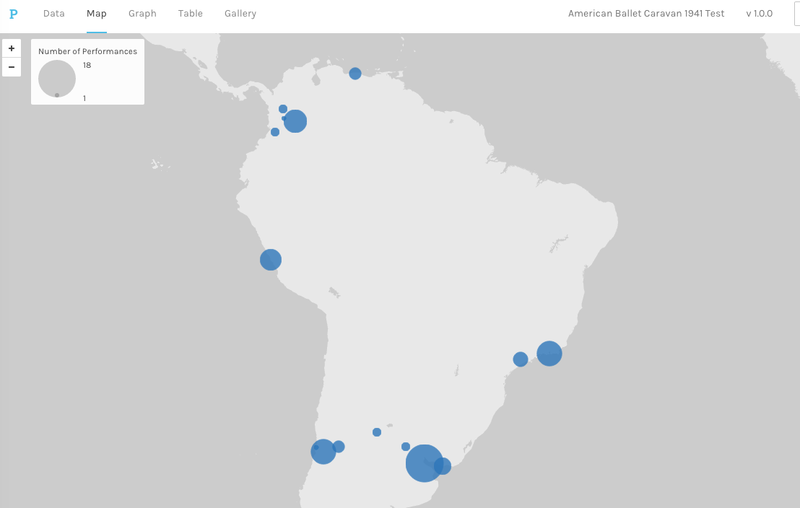 CartoDB allows users to merge datasets and also to layer multiple datasets. This screengrab comes from a map that is not very pretty (yet), but informative nonetheless. This map consists of two layers. The farther-back layer is drawn from a dataset with the routes converted to GeoJSON linestrings. Here each string is labeled with the type of transportation. Right now, these are simply represented as direct lines, although in the future they could be arced, or even made to run along a suggested route (so that boats would not be, for example, running on land). The second layer is based on several tables which have been merged inside CartoDB on the basis of “stay” identifiers. The choropleth is based on number of performances per city, from 1 to 18. I made the distribution uneven, because there is a much finer gradient of performances in the lower numbers than in the upper, and therefore the difference between 1 and 2 performances seems more significant than, say 15 and 18. The cities with null values are white with a 50% opacity (they were only passed through in transit). I’ve also added labels that appear on a hover and list the city name and number of performances for the cities in which performances occurred, although they are currently blank for transit cities. This composite map is useful in how it begins to pull the pieces together. 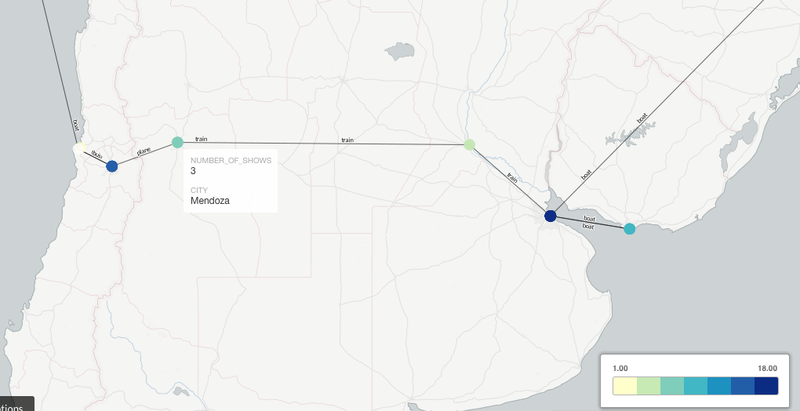 Montevideo, for example, suddenly appears very important as the only location not “on the way” — compare this with the one-night stands in Vina del Mar near the water, or Manizales along the rail journey. The addition of certain transit (non-performance) cities also begins to flesh out a more circuitous journey, such as the transition in Callao from boat to train between Valparaiso and Lima. Like Palladio, CartoDB is also an evolving system. Last time I explored, they made it very easy to customize the CSS file, but there were a limited number of “out of the box” options. Since then, more have been added. One of the more straightforward settings is to animate chronologically a heat map of number of performance days per location (note: not performances), which can be set cumulatively as well, so that it leaves a trail across the map. Another possibility with CartoDB is to set up a poster-style map that plots cities based on density of a particular dataset column. With this color scale, it is very easy to see at quick glance the proportion of performance dates per location across the continent. These maps can also be modified by other parameters as well. For example, in the database, I categorize the shows into three buckets: “matinee,” “evening,” and “[evening].” The last refers to a show that is likely evening but only listed in the budget documents as under a sub-type, ie: “subscription” or “benefit.” Here is an example of a map where animation is essential, because multiple performances often occurred at different times of day in the same place. I’ve set the duration to be slower, so that there is time to see the color changes. However, the visibility of particular shows depend on a change in time of day. It is much easier now to set click or hover-based information pop-ups, which used to have to be entered in CSS form. Although I haven’t done much with them, there are many more wysiwyg tools than before for annotation, titles, etc. Once you get used to it, the forking of one dataset to many possible maps is useful. 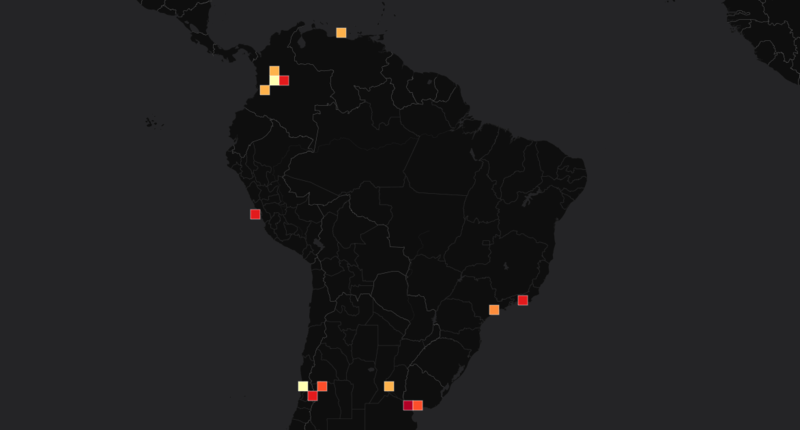 The timebar in the lower left does not have the same visual appeal of CartoDB’s other features. I need to look into custom mods people have done. Any kind of point-to-point map still requires custom code. Next time! In the previous post, I wrote about some of the challenges I was facing to clean datasets based on letters from the Rockefeller Archive Center and certain New York Public Library Performing Arts Library collections. Since then, I have reviewed and manually entered material from two more important collections: one that provides concrete anchors for much of the previously less certain data, and another that ventures into the realm of historical fiction. The former comes from the New York City Ballet’s meticulous archives, which include everything from bulletin-board notices instructing dancers where and when to receive particular shots before departure, to invaluable budgetary paperwork. These critical documents revise certain previous assumptions. For example, they clarify the dates, times, and types of performances in particular cities, thus identifying which fifteen cities mentioned in previous documents the dancers performed in, versus which of the total sixty they traveled through or only visited as tourists. This lends itself to cleaner timelines, or even exploratory maps that chart number of shows per city versus population. At the same time, it is worth noting that these only mark where dancers performed, but not durations of travel or interim stops along the way. These documents also foreground mobility capital. While my previous data on types of transportation had been piecemeal, the budgets meticulously records amounts spent on trains, planes, cars, and busses. I have already made certain selections by only entering those used to transport dancers longer distances (ie: from an inland city to a port city in order to take a boat), rather than also including shorter rides, for example the taxi from a train station to a hotel. A necessary decision going forward will be whether to only trace the movement of the larger group as a whole or whether to also include accessory movements, for example of Lincoln Kirstein back to the US to request deferrals of male dancers’ draft orders, or the flight taken by an injured dancer in order to catch up with the train-based group after staying behind. Another new opportunity suggested by the NYCB archives comes from the paperwork collected for the purposes of blanket and individual visas. This include lists of the dancers’ and other personnel’s places of birth and citizenship, which reinforce the disparate forms of contact engendered at a person-to-person level by such a tour. Beyond the scope of this project, there are also opportunities for material histories that focus on props, costumes, etc., such as logs of replacements and repairs or the fact that the dancers left New York with 550 pairs of pointe shoes. I said there were two new source collections. The second is a 400-page “fictional” unpublished manuscript that was written by one of the dancers while on tour, and comes along with a key to a good portion of the pseudonyms used. In addition to a lot of gossip, the account fills out some of the empty spaces between the dots on the map. Although not consistent, this perspective yields more data both on the locations in between, and on the duration of those transitions. Events take place, for example, where boats stopped between New York and Rio de Janeiro, or on the way up the west coast from Vina del Mar to Lima. Likewise, the lengths of particular journeys are mentioned, as is the tendency to travel through the night. Even amid the interpersonal relations of bored dancers far from home, this manuscript further continues to fill out the dancer’s own interconnected worlds, such as the Russian wardrobe manager who had already done two tours of South America with another ballet company. Together, these offer exciting new resources, and lots of angles from which to begin! 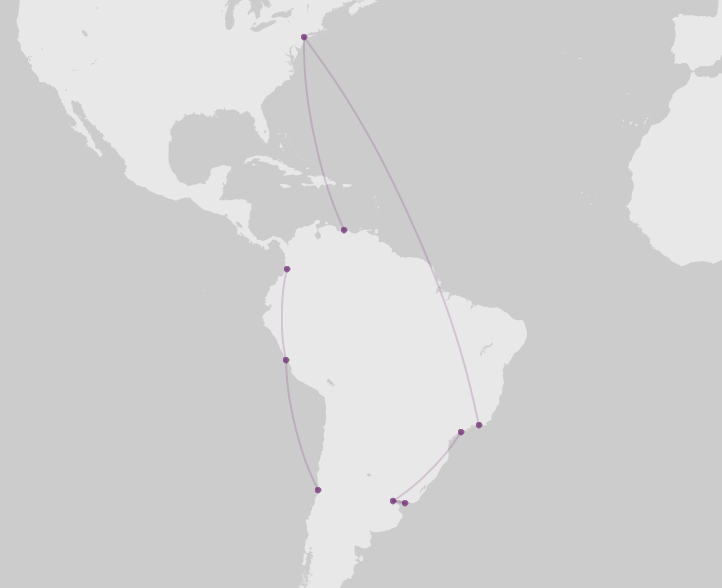 This summer, I am doing test visualizations with data from American Ballet Caravan’s 1941 tour of South America, with specific interest in the affordances of various available tools. My work is supported by a Digital Humanities Summer Grant from the University of Bristol. This tour is special for a few reasons. 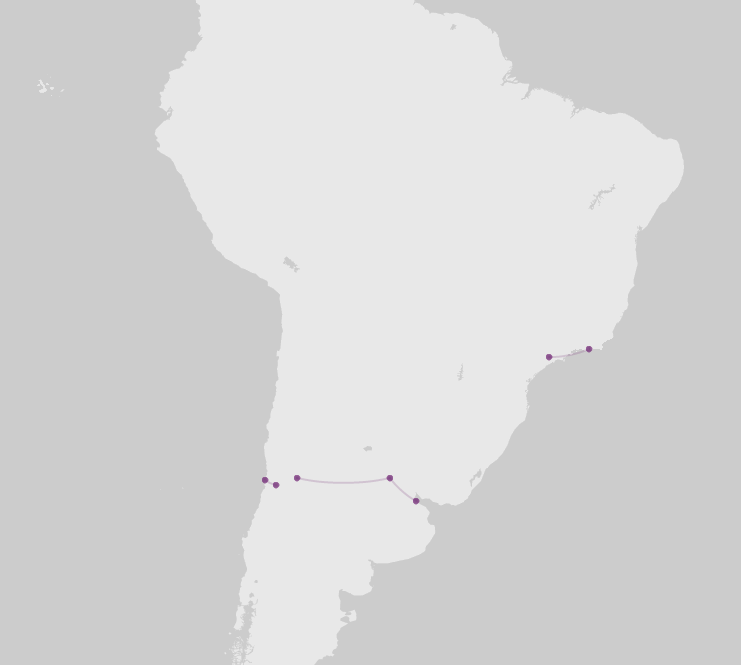 First, over the course of five months, the forty-six employees of American Ballet Caravan managed to pass through almost every country in South America, with the exception of Bolivia and Paraguay, playing ninety engagements in about sixty cities. These performances took on a variety of formats, from subscriptions and benefits, to lecture-performances for theatres unable to support full productions. This exceeded the touring scope of any previous North American or European dance company,and also got them stuck in a blizzard in the Andes mountains. 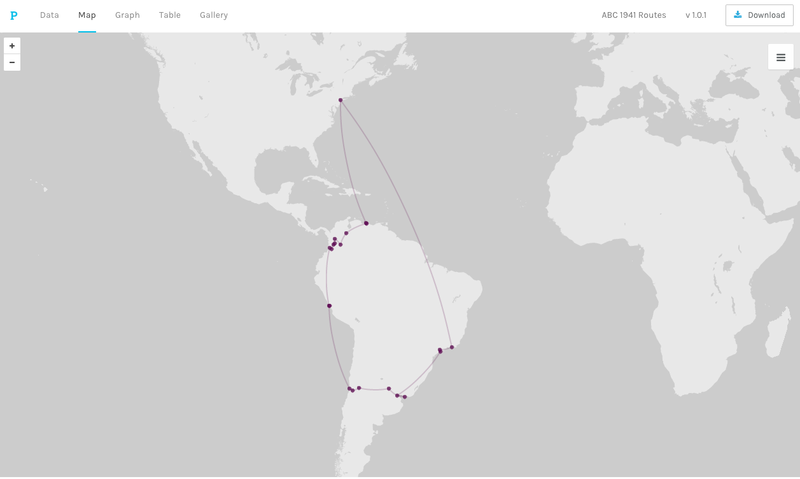 In this first post, I am going to explore the types of datasets available in the archives that I have had access to so far, and some of the challenges of organizing them for this spatial-history-based inquiry into the economics and backstage labor of transnational dance touring. Contextual notes to accompany such itineraries (i), in particular by the South American management organization Sociedad Musical Daniel, whose annotations concerned everything from potential audiences to altitude. Formal reports prepared and submitted by Kirstein to Rockefeller before, during, and after the tour. These include reflections on the larger stakes of the endeavor, as in one report submitted four months into the tour, which addressed multiple categories of success (“financial return,” “reception by the press,” and “residual prestige”) on a city-by-city basis. Less formal letters and reports by Kirstein and others to Rockefeller and his colleagues. These include more piecemeal reports about reception and particular challenges encountered, as well as allusions to past and future plans. Personal documents by performers, including scrapbooks, photographs, and satirical writing. These are all fascinating in themselves as historical stories that reveal the importance of infrastructures. For example, the tour was not only rerouted two weeks prior to departure, but it had to be rescheduled again once it was underway, due to weather and political conflicts (both World War II and the Ecuador-Peruvian War). In terms of means of transportation alone, a blizzard over the Andes cut off train travel and stranded the company in Mendoza for about ten days, before they were able to charter a private jet to Santiago. And while WWII would seem to have been taking place far away, Atlantic shipping schedules were thrown off, and the company ended up needing to take a Spanish refugee ship originally from Bilbao between Santos and Buenos Aires. I am trying to break these stories down to “raw” data and classify them. In terms of a confluence of dates and places, there is no single authoritative travel plan for the tour since it ultimately unfolded between June and November 1941. Therefore, I have been categorizing the pieces of information in various documents as “prospective” versus “past,” although even seemingly-authoritative references to what already happened at times contradict one another! Some specific dates are clear, such as the opening night in a particular city. Others specify a range. For example, the company gave nineteen performances over a period of twelve days in this city, versus only two shows in another one. Seventy-one performances were supposedly done by the time of a report dated September 9th, but then again, the same report also makes reference to September 21st as in the past. It is not consistently possible to identify the difference between travel dates and performance dates, and we also know from complaints about performer fatigue that they sometimes also traveled in the day and performed the same night. One of the techniques I have been using to smooth this data is to count the number of calendar weeks for the twenty-four-ish week tour. Although this is not necessarily representative of the number of shows on a city-by-city basis, it allows for uncertainty in terms of dates while still setting up a clear temporal sequence. That said, establishing a comprehensive, sequential list of locations is equally problematic. While eighteen cities are named in the reports and letters, there are references to a total of sixty cities. This suggests less than a third are accounted for, namely the locations in which the company stayed more than one night. Many additional cities appear in the planning documents and, while it is possible to speculate as to where they would fit geographically, there is no evidence the company ultimately appeared there. Beyond performance and travel locations and dates, there are other types of data within these documents. In terms of logistics, we can note modes of travel (boat, train, plane, car); whether a given country offered a subsidy for the tours in their region; and the type of performance (subscription, benefit, regular, lecture-performance). Among other, more qualitative forms of data, we note where American Ballet Caravan reported gaining or losing money, and list the other international companies referenced as benchmarks for their reception in given places. These datasets will be key to better understanding what John Urry would call the “mobility systems” of dance touring. If you go over to CartoDB, I’ve posted another version of the same Leningrad-Kirov material, where you can manipulate the time slider yourself (or leave it on autoplay). They stay in New York for a bit, but then things get moving.